1. Is the file name descriptive, is the file in the .docx format, and is the file NOT protected? 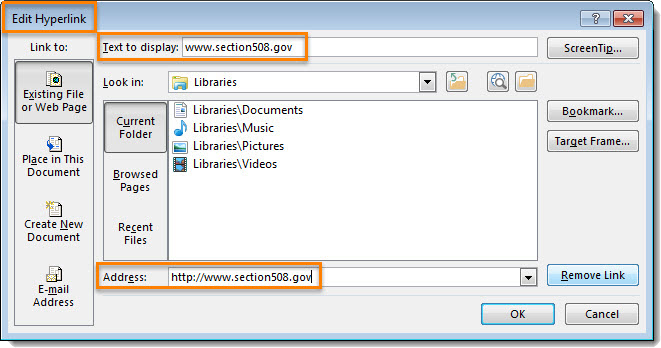 Instruction 1: Look at the filename in Windows Explorer OR the title bar in MS Word. An example of a non-descriptive file name is "Document1". An example of a descriptive filename is "FY16-Report.docx." The file must be in the "*.docx" format for accessibility testing to be possible. NOTE: If the document extension is not displayed, open your documents folder in Windows Explorer, select "Tools>Folder Options>View>uncheck 'Hide extensions for known file types'>OK." Test B: Is the file in "Word Document (.docx)" format? If not, the document fails this test. 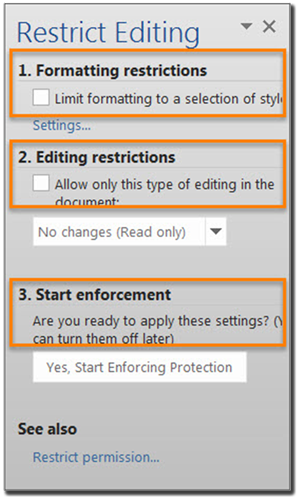 Instruction 2: Select the "Review tab>Restrict Editing" and look to see if the "Stop Protection" button appears at the bottom of the "Restrict Editing" pane. If the "Restrict Editing" pane shows options 1, 2, and 3, then restricted editing is turned off. 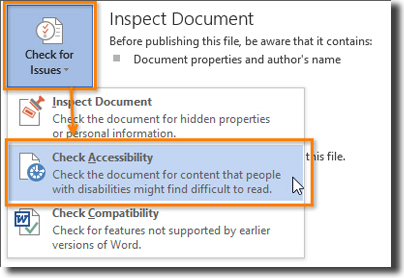 Document protections limit the ability to test for accessibility and can make portions or the entire document inaccessible. Test C: Does the "Restrict Editing" pane show options 1, 2, and 3? If not, the document fails this test. A descriptive filename that identifies the document or its purpose helps everyone (including people with disabilities) locate, open, and switch between documents. 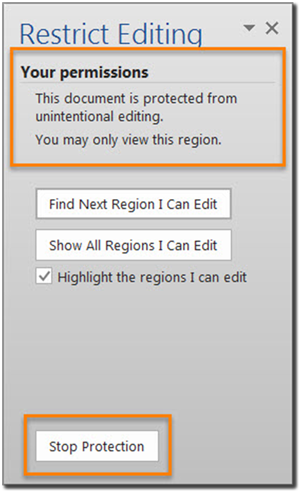 In addition, the document must be in a ".docx" format because these authoring and testing instructions will only work if the file is in the ".docx" file format. 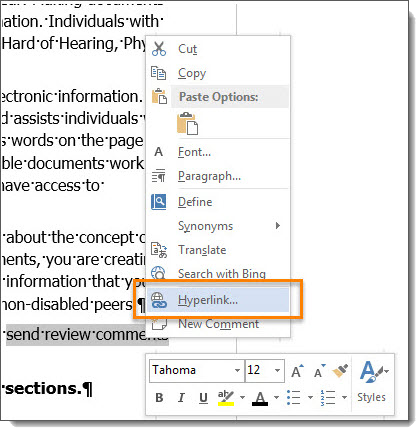 Document restrictions limit or prevent users of assistive technology from reading or editing the document. If you must use document restrictions, turn them off during testing and then ensure assistive technology users have access to the password. Save as type: "Word Document(*.docx)." Save the document with a descriptive filename. 2. 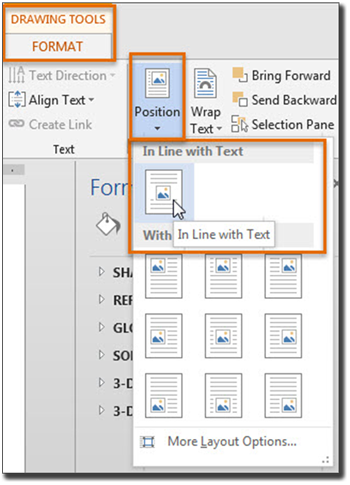 Do document headings use the MS Word heading styles? Open the "Navigation pane (Ctrl+F)" and select the "HEADINGS" tab. Test A: Do the headings in the "Navigation pane" mirror the headings you see in the document? If not, the document fails this test. Test B: Do the headings you see in the "Navigation pane" match the visual outline of your document (i.e. the same hierarchy)? If not, the document fails this test. Headings organize content and make finding information easier. Assistive technology cannot infer meaning if you just format the text (such as increased font size, bold, or underlined text). Heading styles create a structure that assistive technology can quickly access and aid document navigation based on the heading levels. Select "Home tab>Styles" (or "Ctrl+Alt+Shift+S" to open the "Styles pane") and apply heading styles to the headings in your document. 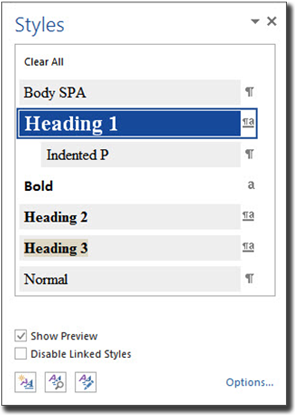 Type your heading, place your cursor anywhere within the heading, and then select the heading style you want to use. If you have different heading levels (such as chapter, article, section, topic, etc. ), then you must use a different style for each heading type. You can modify styles to create the look and feel you want in your document. 3. Are lists formatted correctly? Place your cursor on a list item. Open the "Reveal Formatting pane (Shift+F1)". Test: Is the "List" option visible under "Bullets and Numbering?" If not, the document fails this test. 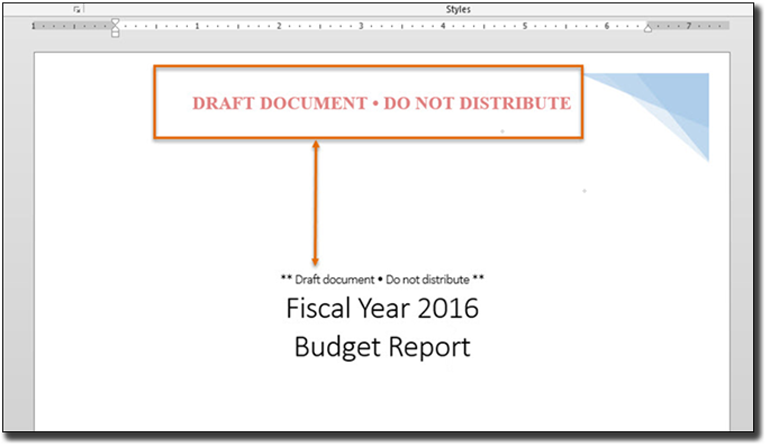 Select "Home tab>Paragraph" and use the "Bullets," "Numbering," or "Multilevel List" features when formatting lists in your document. 4. Are columns of content formatted correctly? Place your cursor on content that appears to be formatted in columns (e.g. similar to how a newspaper article will span multiple columns). 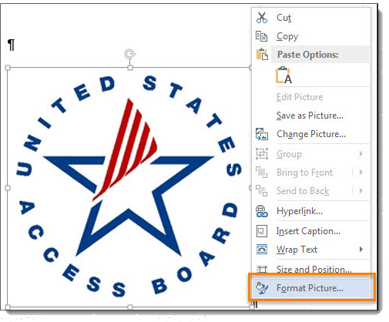 Open the "Reveal Formatting pane (Shift+F1)" and expand "Section" by selecting the arrow sign. Test: Are "COLUMNS:" listed under "Section?" If not, the document fails this test. 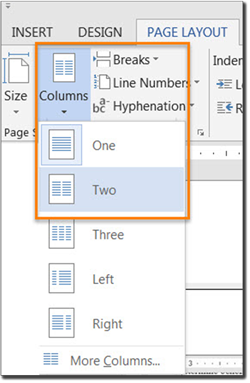 Select "Page Layout tab>Page Setup>Columns" when creating columns in your document. Select content you want to format. Select the number of columns you want. 5. Are layout tables formatted correctly? Instruction 1: Layout tables arrange content on the page. Place your cursor on the first cell of your layout table. Use your "Tab" key to navigate through the table. Test A: Does the tab order match the visual layout? If not, the document fails this test. 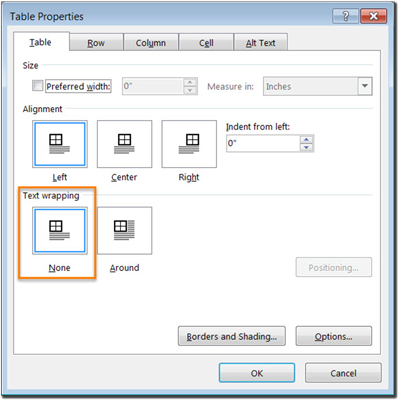 Instruction 2: "Right click" or "Shift+F10" inside a layout table and select "Table Properties>Text Wrapping." Test B: Is "None" selected? If not, the document fails this test. Layout Tables create a structure that screen readers and assistive technology can use to read information in the correct order (left to right then top to bottom). If the table is formatted to allow text to wrap around the table, assistive technology users will have difficulty finding the wrapped text on the page. Select the desired number of columns and rows. Text wrapping is automatically set to "None." 6. Is text formatted for the intended language? 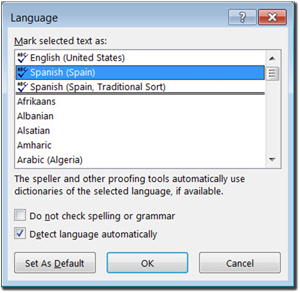 If the document contains words or phrases in a language other than the predominant language, place your cursor on that text. Open the "Reveal Formatting pane (Shift+F1)" and look under "Language." A document can contain sections written in different languages. Assistive technology cannot infer the correct pronunciation from just text, so text must be formatted in the correct language. Select "Review tab>Language>Set Proofing Language." 7. Are link names descriptive? Learn more about section 508 compliance. To insert a link, copy the link (e.g. URL), select the desired text, "right click" or "Shift+F10," select "Hyperlink," paste the link in the "Address" field and select "OK."
8. Is vital information in headers, footers, and watermarks duplicated in the document? Look for vital information in headers, footers, and watermarks (e.g. Respond by X Date, CONFIDENTIAL, or Do Not Distribute). 9. Did you use built-in features to create data tables? 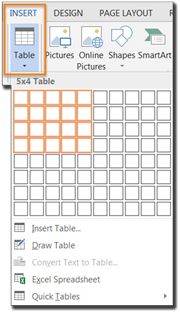 Instruction 1: Select a table and see if the "Picture Tools" tab shows up in the Ribbon instead of the "Table Tools" tab. If the "Picture Tools" tab shows in the Ribbon, then the table is a picture. Instruction 2: Place your cursor on a table, select "Table Tools>Layout tab>Table Group>View Gridlines" button, and look for table cells that are merged or split. Instruction 3: Place your cursor on any cell of a "Header Row." Open the "Reveal Formatting pane (Shift+F1)" and look under "Table." If the header row is not set, 'Repeat as header row' will not show up in the "Reveal Formatting" pane under "Table>Row." Test C: Is "Repeat as header row" identified? If not, the document fails this test. Instruction 4: Place your cursor on a table, "right click" or "Shift+F10," and select "Table Properties>Table tab>Text Wrapping." Test D: Is "Text Wrapping" set to "None?" If not, the document fails this test. Place your cursor on the first row, "right click" or "Shift+F10," and select "Table Properties>Row tab>Repeat as header row" button. NOTE: If you need to create complex data tables (data tables with more than one header row, one or more header column, and/or merged or split cells), then you must convert the document to an accessible format (i.e. a PDF document remediated for accessibility). Complex data tables cannot be made accessible in MS Word. 10. Do images and other objects have alternative text? Instruction 1: Select an image or object that conveys meaning, "right click (or Shift+F10)>Format Picture (Note: could say Format Object, Format Shape, etc. )>Layout & Properties icon>ALT TEXT," and read the "Description" field. Also, look for a caption or a description of the image or object in nearby text. Test B: Do descriptions use 125 characters or less? If not, the document fails this test. Instruction 2: Select an image or object that is just for decoration, "right click (or Shift+F10)>Format Picture (Note: could say Format Object, Format Shape, etc. 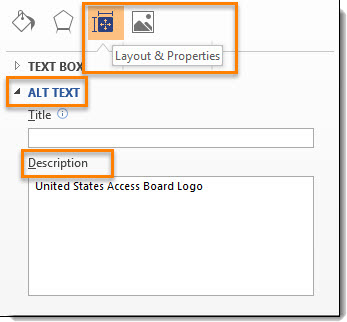 )>Layout & Properties icon>ALT TEXT," and read the "Description" field. Test C: Do the "Description" fields of decorative image or objects contain two spaces between quotes? If not, the document fails this test. To enter "ALT TEXT," select the image, object, or shape. "Right click" or "Shift+F10" and select "Format Picture (Note: could say Format Object, Format Shape, etc. )>ALT TEXT". In the "Description" field, enter information that states the purpose (in 125 characters or less) for a meaningful image or object OR enter a space or two spaces between quotes for decorative objects. Then select "close." 11. Are images, objects, and text boxes in line with the text? Run the 'Accessibility Checker' through "File Tab>Check for Issues>Check Accessibility". Test: Did you get any "Object not Inline" warnings? If so, the document fails this test. 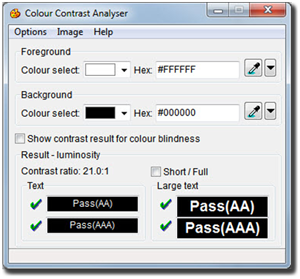 Screen readers and other assistive technologies cannot access or edit information in images, objects, and text boxes unless they are in line with text. Select the image, object, or text box. Select "Picture (Note: could say Object, Shape, etc.) Tools>Format>Position>In Line with Text." 12. Are colors and other visual characteristics (such as size, shape, and location) that convey information also described in text? Find where you have used color and/or other visual characteristics to convey meaning such as green, yellow, red, etc. 13. Is the contrast ratio between text and background sufficient? NOTE: If the document text is black on white background (or close to it), you do not need to perform this test. 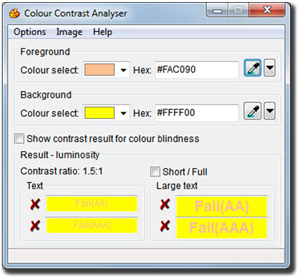 This test requires the Colour Contrast Analyser (an external application). 14. Are there corresponding descriptions of your embedded files and are they accurate? Activate the audio-only, video-only, or multimedia file. If you embed an audio-only, video-only, or multimedia file that contains meaningful information into your MS Word document, you must also provide additional information so that individuals with disabilities have comparable access to the information. 15. 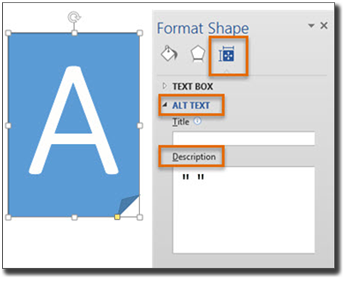 Did you avoid forms while using MS Word 2013? Look for interactive Word form fields. Ignore blank table fields, blank spaces, or underlines that users fill in text are not interactive Word form fields. You are looking for the Word built-in form features that are interactive and can collect data. These Word form fields cannot be made accessible. Test: Is the document free of all MS Word form fields? If not, the document fails this test. Forms created in Word cannot be made accessible for users of assistive technology and OMB certifications are likely required. The Office of Media Management (OMM) develops, certifies, and maintains fillable forms. See their PinPoint request wizard for more information and to request services. 16. Did you exclude flashing objects?